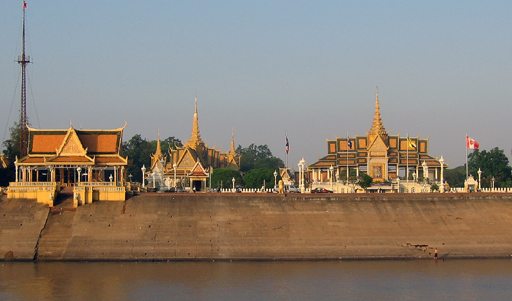 The formalities for crossing the boarder from Vietnam into Cambodia were handled by the crew of the RV Mekong Pandaw. 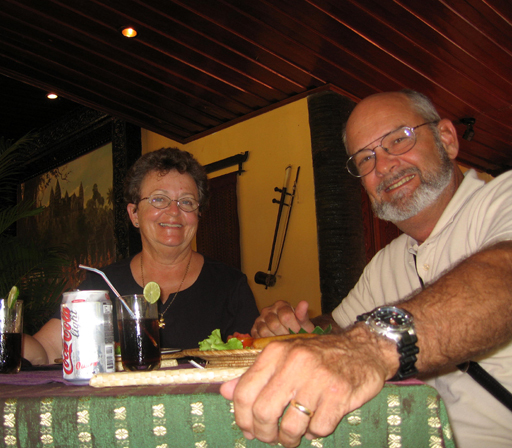 The Vietnamese ship's captain and the onboard tour guides changed at the boarder and were now Cambodian. 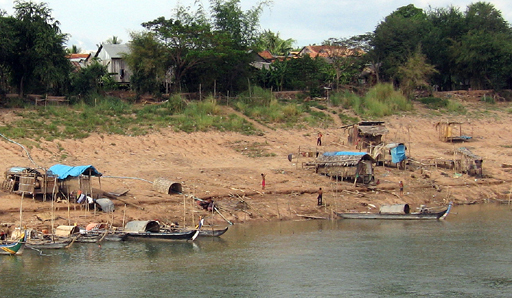 The Mekong River itself also changed, as we moved out of the Delta the banks of the river became higher. Temporary structures along the river bank also increased, these will be gone in a few months as the river rises. The remnants of the French colonial city once known as “the pearl of the orient” are still apparent today, but the long years of war and poverty are taking their toll. 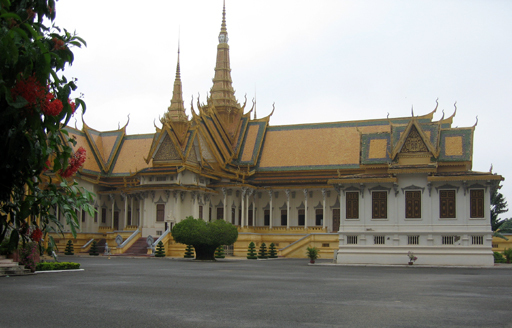 The splendid Royal Palace built by King Norodom in the late 1800's contains many of the cultural treasures of the Cambodian people. 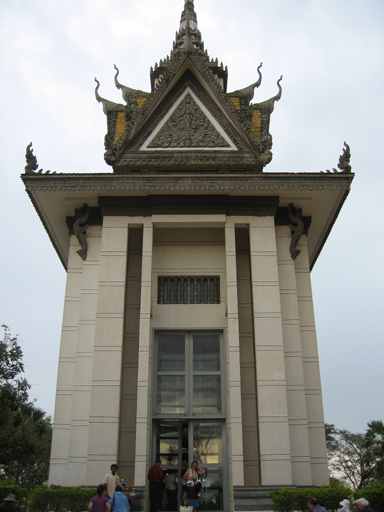 Although many of the treasures of the Royal Palace were looted by the Khmer Rouge most were kept in tact for propaganda purposes. The floor of the temple of the Emerald Buddha is covered with 5329 silver tiles weighing 2.75 lbs each and it contains in addition to the Emerald Buddha, a gold Buddha weighing 198 lbs and ornamented with 286 diamonds, one weighing 25 carats and another at 20 carats. 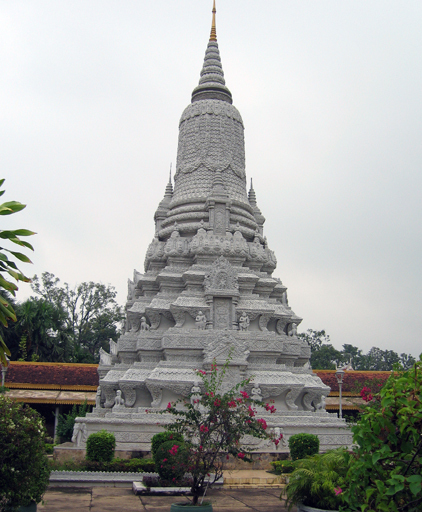 Memorial Stupa of King Norodom on the grounds of the Royal Palace. 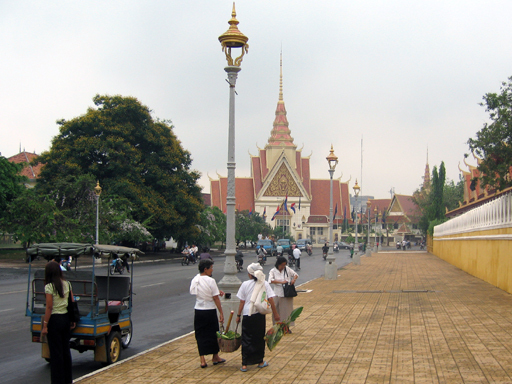 The saffron robes of the Cambodian Buddhist monks are seen everywhere, including touring the Royal Palace. This scene outside the main market in Phnom Penh juxtaposed with a similar scene outside the Cholon Market in HCMC is telling. 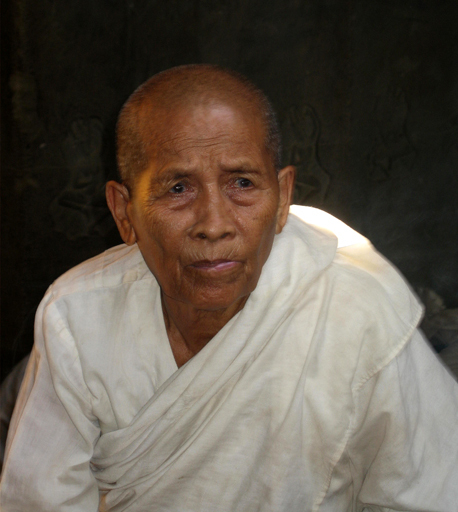 Maybe it was our prior knowledge of the recent history of Cambodia, but it seemed that there was an obvious lack of vitality. 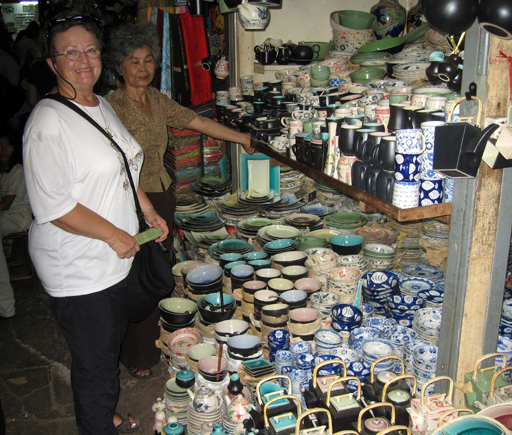 Jane shopping in the market of Phnom Phen. 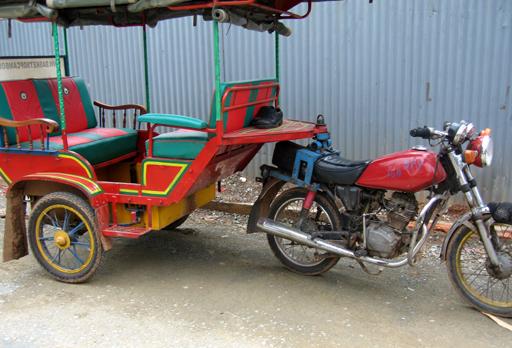 The Cambodian version of a tuk-tuk, a cheaper alternative to the taxi. Visiting the mass graves of killing fields of Choeung Ek and the Khmer Rouge Security Prison S-21 was a brutally depressing experience. Some 17,000 souls, including the hapless crew of a French yacht captured off the coast, were photographed, tortured, made to confess and then executed. This monument contains skulls of more than 8000 of the victims visible behind glass panels. 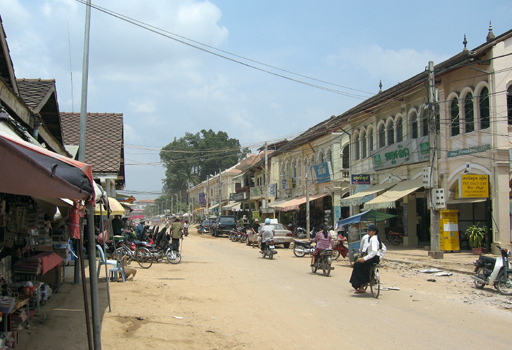 After leaving Phnom Penh, we continued up the Mekong as far as Kampong Cham visiting several villages along the way. Here we disembark at the village of Chong Koh. 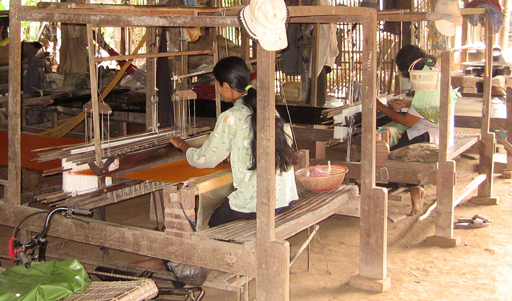 Chong Koh village is known for weaving silk. Almost every house has one or more looms among the stilts supporting the house and every female in the village turns out silk cloth to help support the family. These bright eyed children were as interested in us as we them. 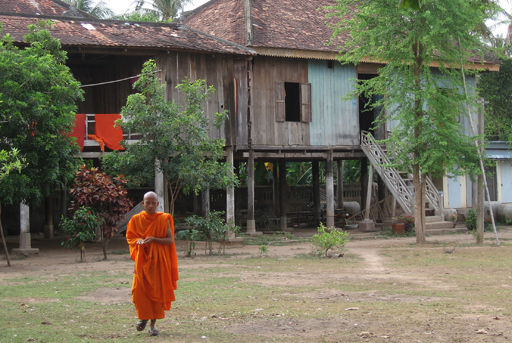 A Buddhist monastery in Peam Chhykaung village. 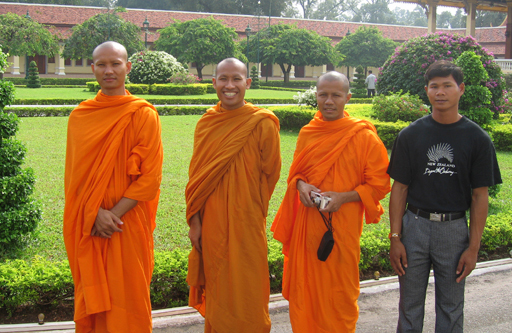 These monks were attending an English language school which we visited and were eager to practice their newly acquired skills. 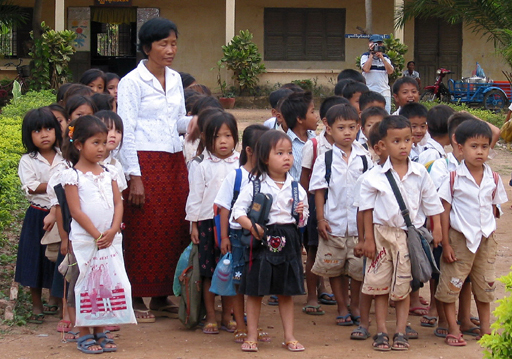 At Peam Chhykaung village we arrived at the public school in time to witness the flag lowering ceremony. The teachers expression might betray the fact that the day is almost over. 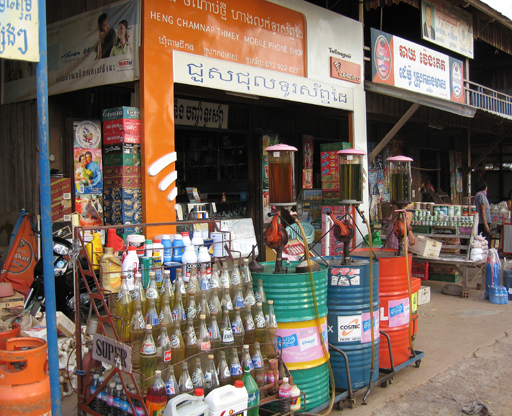 This filling station in Chong Koh village selling three grades of gasoline from 55 gallon drums and fuel for motorcycles in liter drink bottles caught our eye. In Cambodia the motorcycle serves every imaginable purpose. 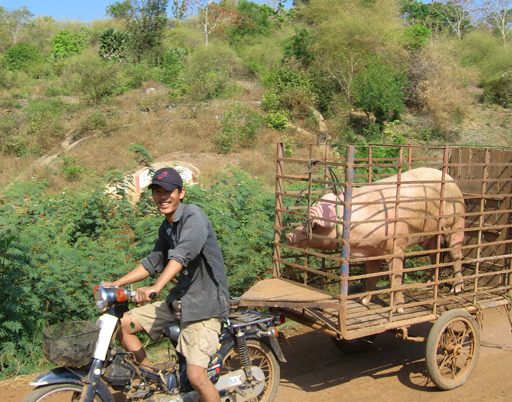 On our walk to the hill top Wat Hanchey we met this piggy going to market. The climb up the hill to Wat Hanchey provided great views of the Mekong in addition to the 8th century structures and sanskrit tablets. 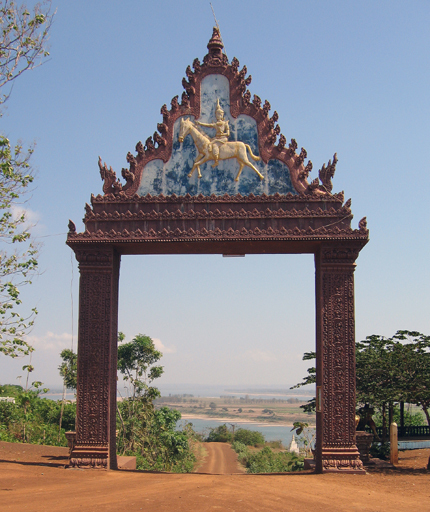 This photo looks out through the gate of the Wat across a bend in the Mekong below. In addition to an 8th century sanctuary that pre-dates the ruins of Angkor, Wat Hanchey contains several more recent temples like this one. 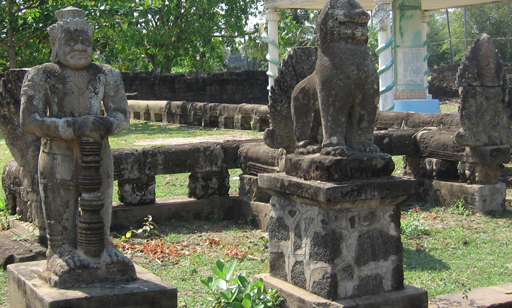 These guardian statues at the 12th century Wat Nokor, like the Khmer culture, stem from the Indian Hindu mythology. Sunset on the Mekong as we head down stream to Phnom Penh and see the last of the Mekong river. 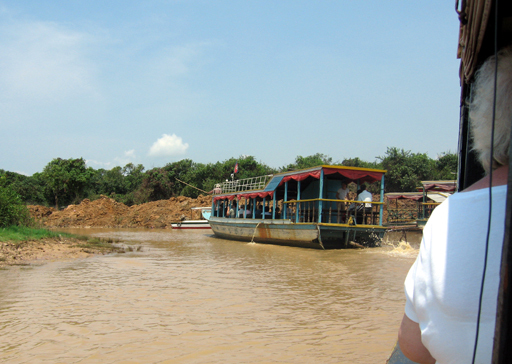 We now enter the Tonle Sap. 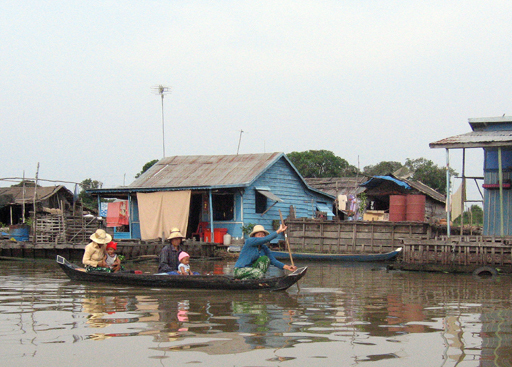 The Tonle Sap river and lake system act as a surge tank for the Mekong. 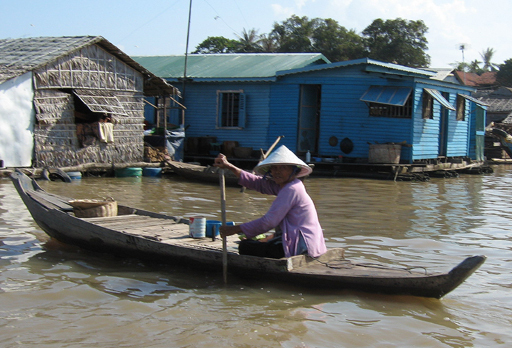 As the Mekong enters the low water season the Tonle Sap lake drains into the Mekong and reaches a size of less than 1000 square miles with a 7 foot depth. 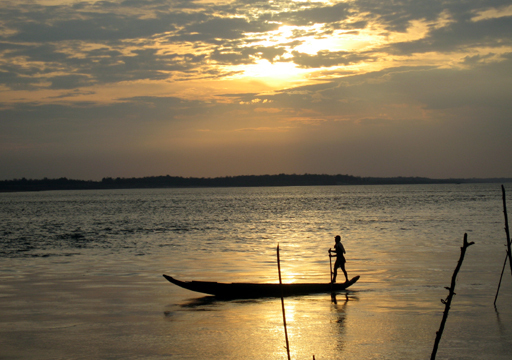 During the high water season Tonle Sap river reverses its flow and the lake swells to over 5,000 Square miles with a depth of over 30 feet. 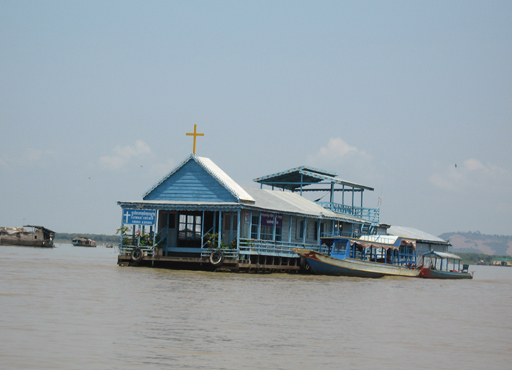 The village of Kampong Chhnang consist of houses on high ground, houses on the river bank on stilts, and houses that float. 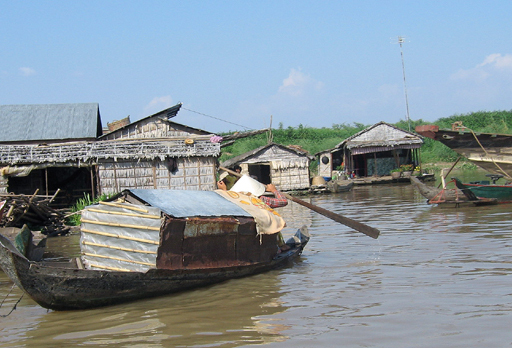 The oar powered sampan is the most common form of transportation in the floating village at Kampong Chhnang. 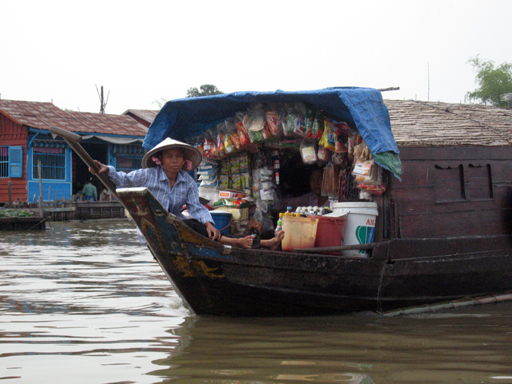 Sampans have many styles to match their many uses. 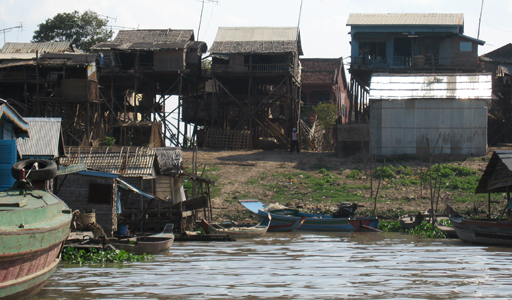 Looking out over a portion of the floating village of Kampong Chhnang gives one a sense of the size of the water borne community. 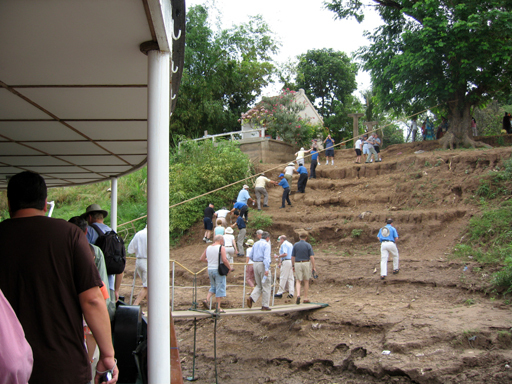 These steps leading from the waters edge to the top of the river bank will become covered with water in the high water season and the market along side these steps will be removed as the water rises. 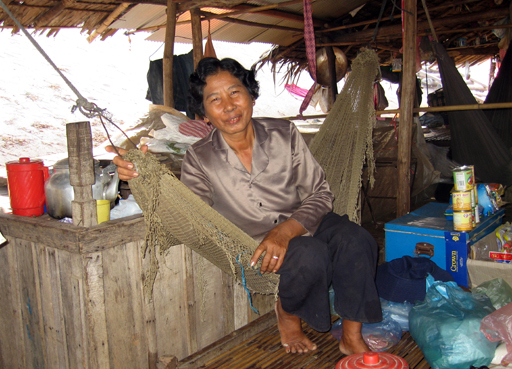 This lady was resting after the early morning rush at her market stall, but allowed us to take her picture. One wonders where she sets up her market stall in the high water season. 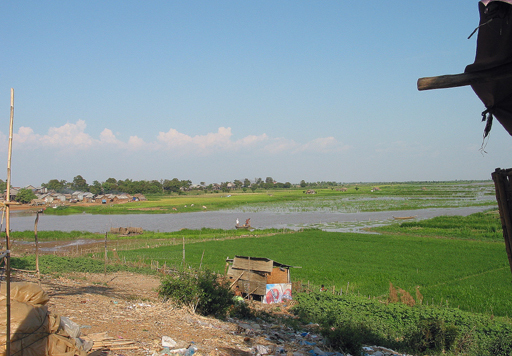 These rice paddies flood during the high water season and the resulting silt replenishes the nutrients in the soil. 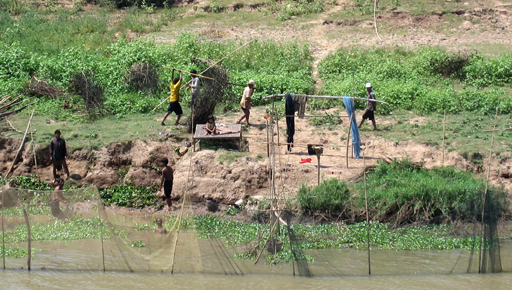 A fish trap being built on the Tonle Sap River. 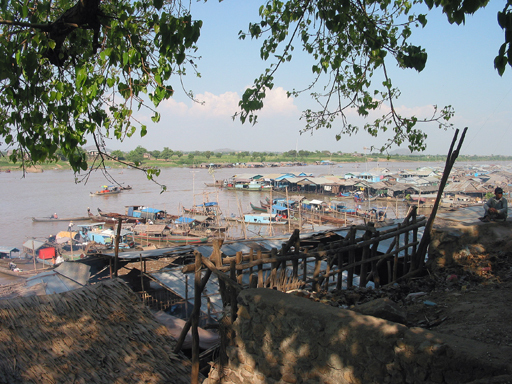 Over half of the fish consumed by Cambodians come from the Tonle Sap lake and river. 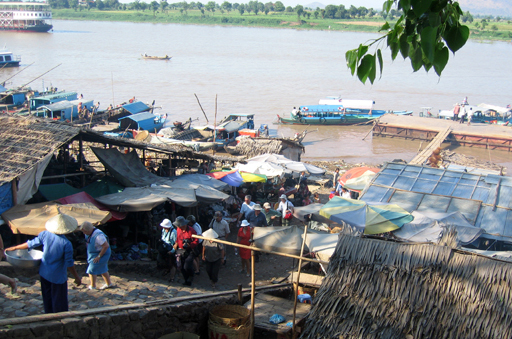 The water in the Tonle Sap lake was already too shallow for the Mekong Pandaw. 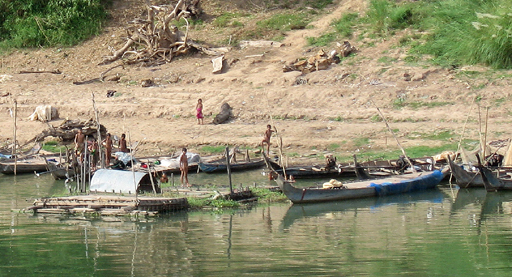 We crossed the lake in smaller craft passing through Chong Kneas one of several floating villages on the lake. 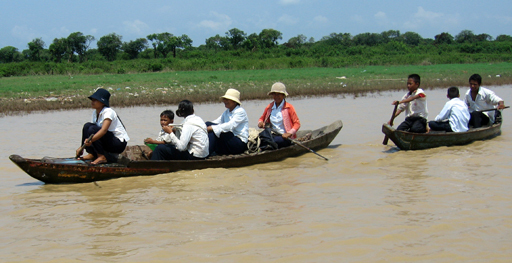 Children from Chong Kneas floating village returning from school in sampans. Even our shallow draft passenger lighters are having difficulty with the shallow waters of the lake. 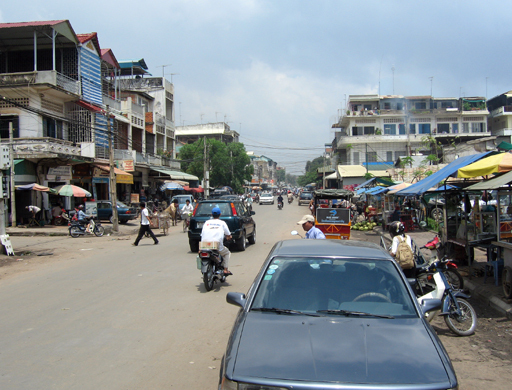 Unable to make the landing we were disembarked near a road to awaiting buses for the 9 mile trip into Siem Reap. Since we were being transferred from the Mekong Pandaw to a hotel in Siem Reap, all the luggage had to be wadded ashore also. 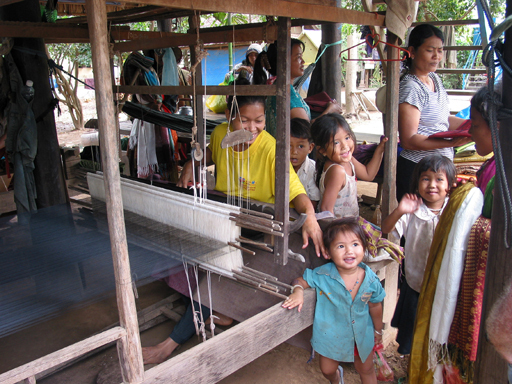 Siem Reap is the gateway to the temples of Angkor which receives close to 2 million tourist a year. Hotels are being built apace, but the wealth all this tourism brings in is not apparent on this street outside the main market. 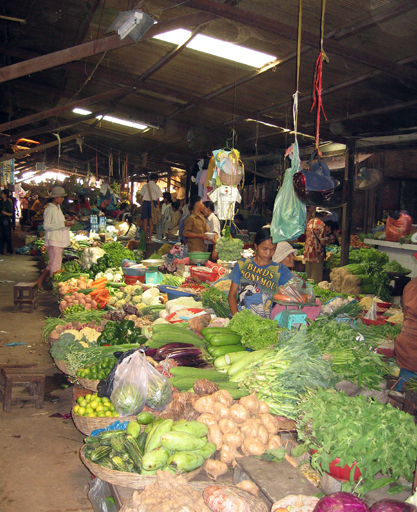 The quality of the vegetables on offer in the market is testimony to the richness of the soil around the Tonle Sap lake. 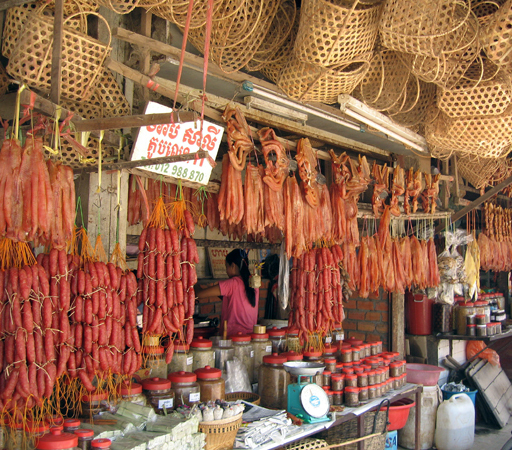 Lack of refrigeration makes smoked and dried meats a necessity. 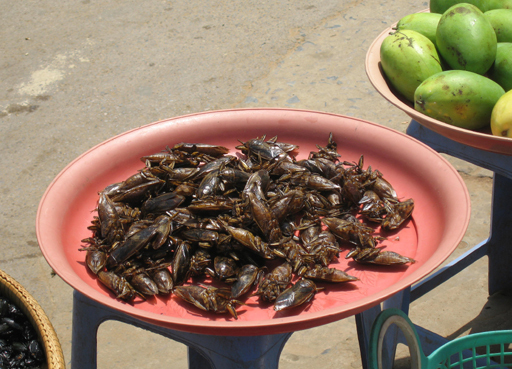 Street vendors in Siem Reap offer fried cockroaches for a snack and they are apparently popular with the local population. 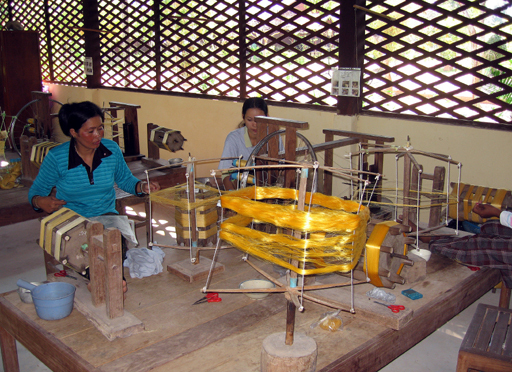 This young lady is spinning the silk fibers into thread. 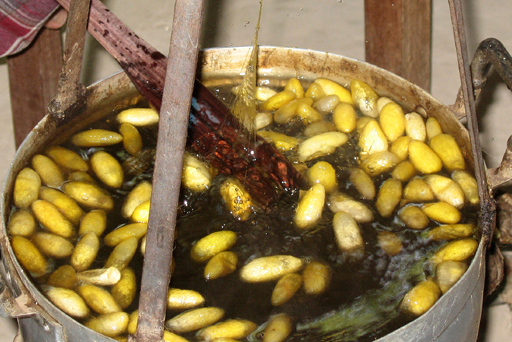 Dyes are extracted from natural sources and applied to the thread. One evening after detaching from the tour we attended a dance and shadow puppet show staged by a French sponsored orphanage. The children were delightful. Another evening we attended a professional performance featuring the graceful Apsaras dance of the Angkor tradition. The Khmer Empire coalesced from the defeat of several minor kingdoms in 802 AD. 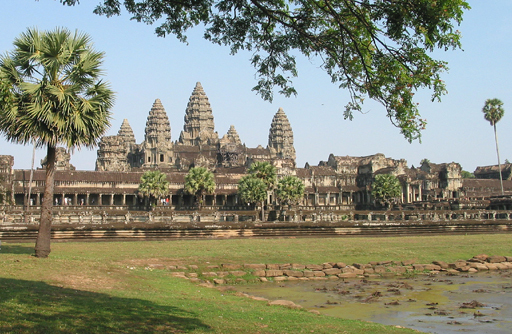 The Empire had several capital cities before moving to Angkor. 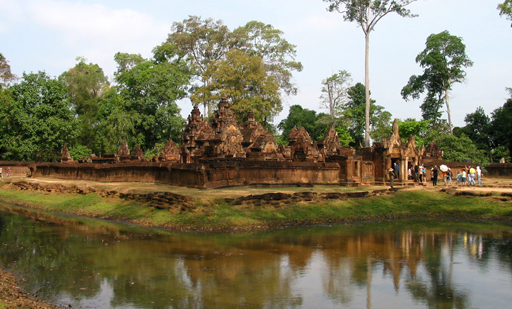 There are many ruins of the empire dotted throughout the 150 square mile Angkor Archaeological Park. 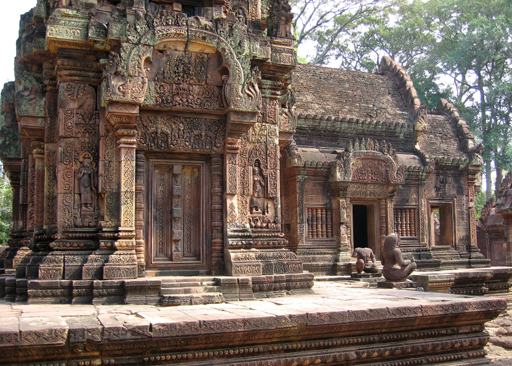 This is Banteay Srei a beautiful Hindu temple dedicated to Shiva. 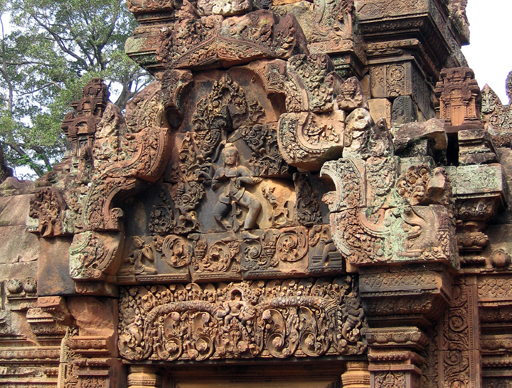 Made from pink stone, Banteay Srei is densely covered with intricate carvings. 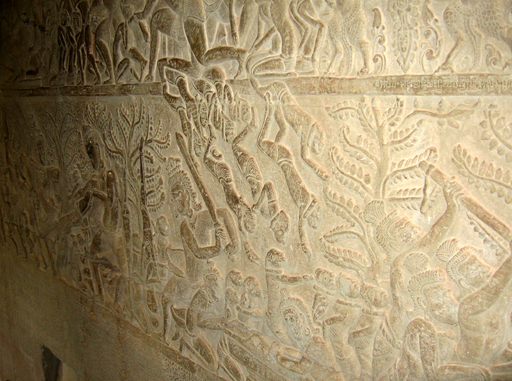 The delicate stone carvings depict scenes from the epic Ramayana. 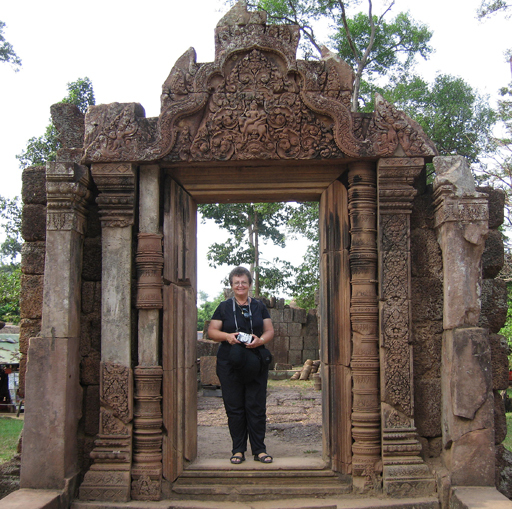 Banteay Srei is one of the finest examples of Angkor stone art and is Jane's favorite Angkorian temple. 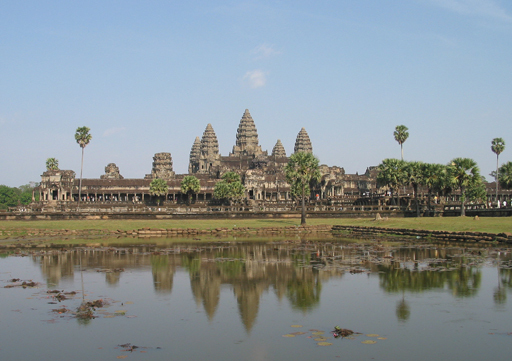 Angkor was the capital of the empire from 893 AD until defeated by the Thais in 1431. 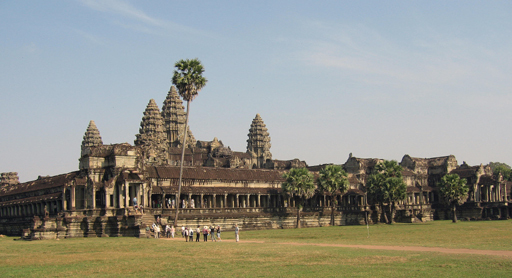 Angkor Wat, largest and best known of the Angkor temples, built in the early 1100's, was the royal temple of its day. It is a symbolic model of the universe with Mt. Meru of Hindu mythology at its center. The central part of the complex represents the holy mountain which has a central peak surrounded by lesser peaks, this is then surrounded by the continents and they by a great ocean represented by the moat. It is not possible to capture the massiveness of the temple complex using a camera without the use of a aircraft. It is said to be the largest religious structure in the world. All of our photos are taken from well inside the moat, which is not shown. 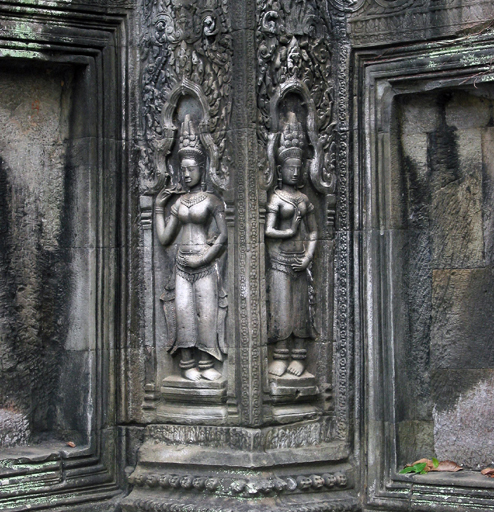 The main temple has an esplanade on all four sides containing marble bas-reliefs. 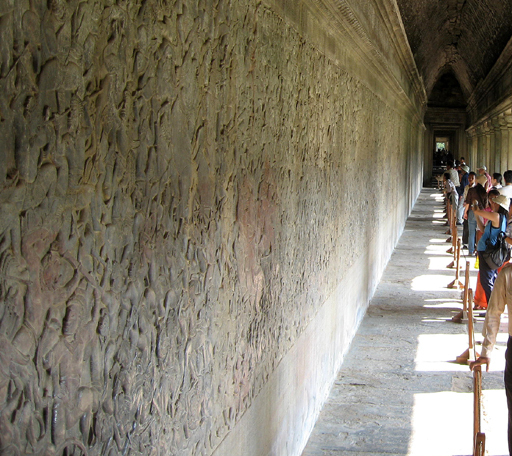 The carvings depict scenes from the Hindu Mahabarata epic and the military exploits of the king of Angkor. 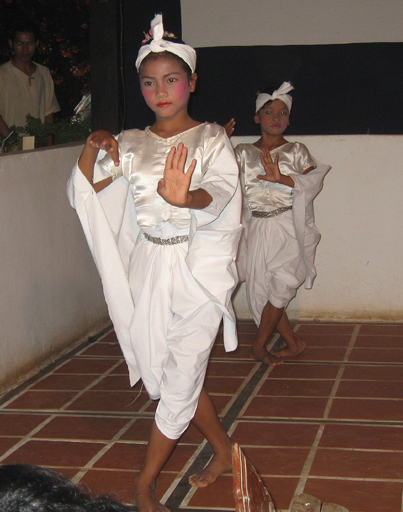 The Apsarases are heavenly spirits proficient in dance and are the inspiration for some classical Cambodian dance. 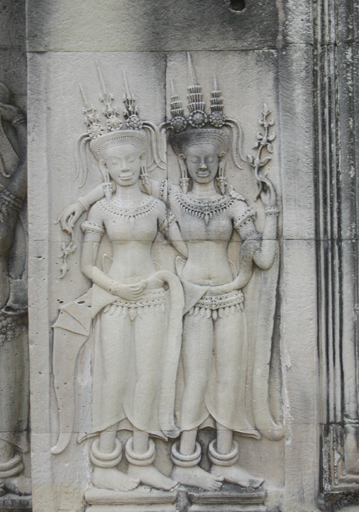 There are reportedly 2000 carvings of these heavenly dancers on the walls of Angkor Wat, but we may have missed a few. Angkor Wat was not abandoned when it was “discovered” by a French explorer in 1860 it was reported to contained a prosperous monastery of 1000 monks. 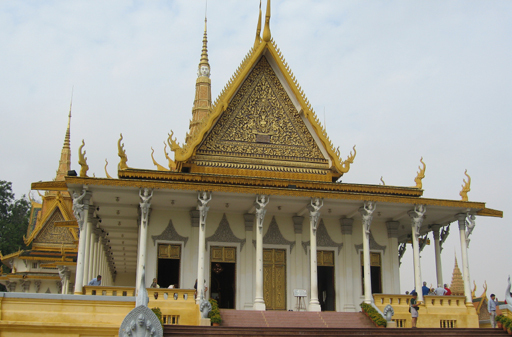 It had been restored by the Cambodian royal family in the 1600's. 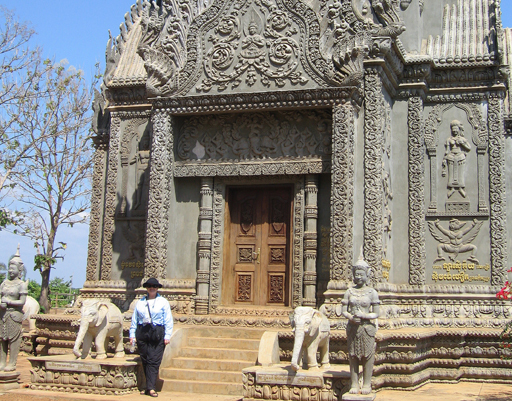 The monk pictured here was tending the statue of Vishnu at the entrance of the Wat during our visit. 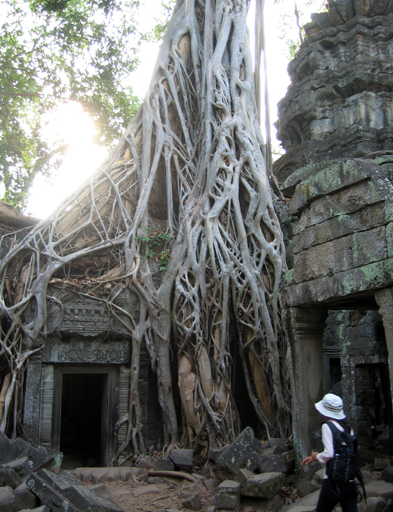 Ta Prohm has not been restored and jungle's assault on this ruin is impressive. 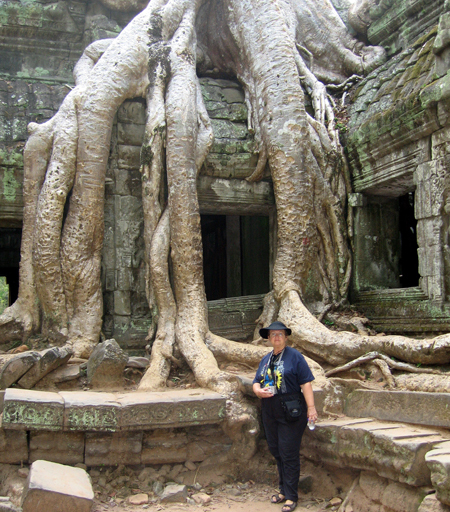 Without Jane in the picture it is hard to understand the gigantic size of the trees that are enveloping Ta Prohm. 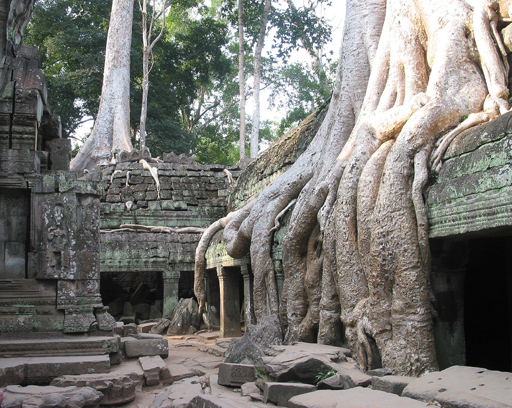 The only way to wrest the Ta Prohm temple ruins from the jungle is to tear it down block by block and rebuild it. In the mean time it makes a great backdrop for Indiana Jones type movies. 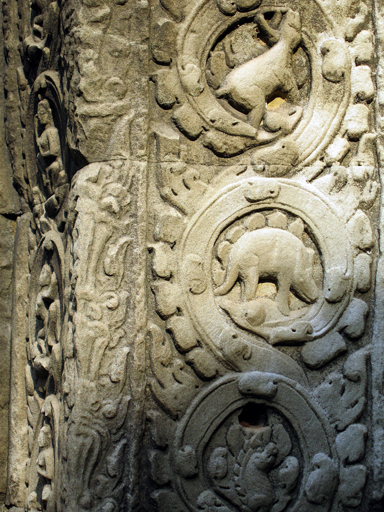 One section of bas-relief carvings at Ta Prohm is of local animals. The one pictured bears a striking resemblance to a dinosaur that the carvers should have had no way of knowing. Angkor Thom is a fortified city built after the original capital city at Angkor was destroyed by the Chams of South Vietnam in 1177. It encompassed an area of 3.8 square miles and was surrounded by a wall 26 feet high and the wall was surrounded by a moat 328 feet wide. 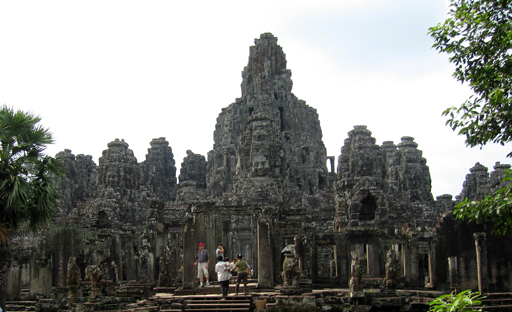 The Bayon, pictured, is a temple at the exact center of Angkor Thom. 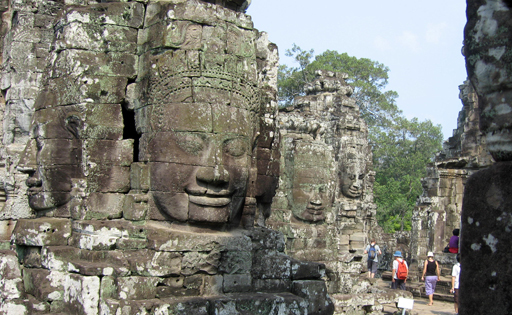 The Bayon has 54 towers with four gigantic faces ,probably of the king, on each tower. After three days touring the Angkor sites we took another ride across the Tonle Sap to visit the Prek Toal Bird Sanctuary and Biosphere. 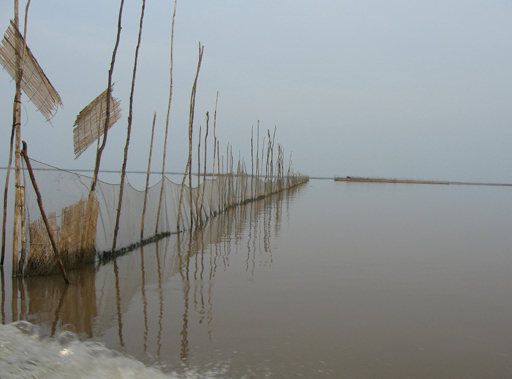 These fences keep fish corralled within exclusive fishing areas. There are gaps in the fence to allow boats to pass. 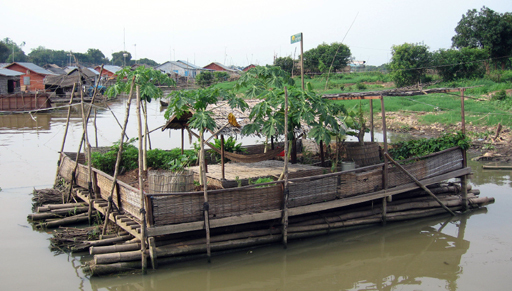 The Prek Toal floating village is at the center of the bird sanctuary. 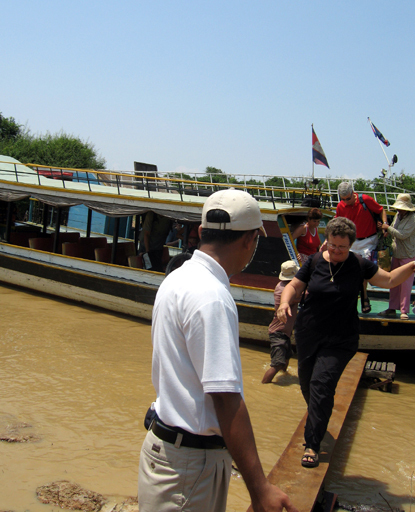 We spent a day touring the Sanctuary by sampan. The level of the lake rises and falls as much as 25 feet during the year and therefore every aspect of the village floats including the gardens. The local grocery store not only floats it drives by your house. 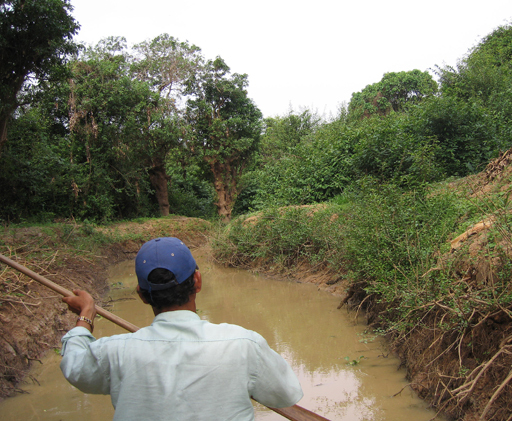 Poking around in the small canals in the bird sanctuary by sampan was an interesting experience in itself. 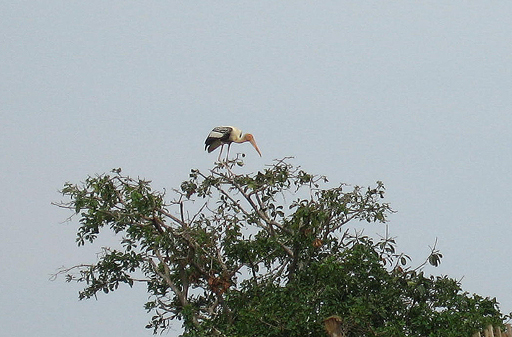 A large telescopic lens would have been handy for photographing the birds, but we were able to capture some of the larger species, like this painted stork, with our little point and shoot. 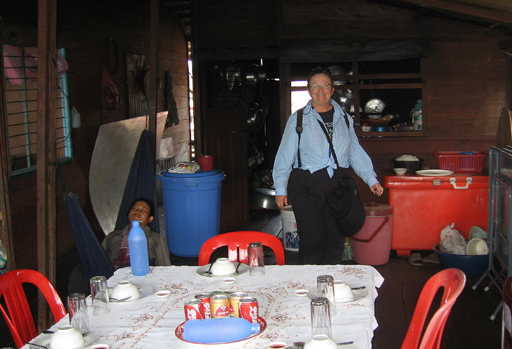 After our sampan tour we had lunch in a floating restaurant, of course. 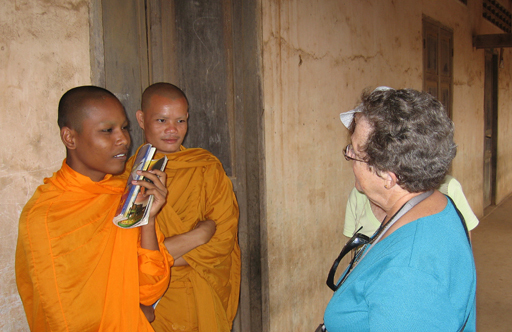 One can not see all of the amazing sites of Angkor in just eight days, but it was interesting and we enjoyed each day.